Review (Part 1 of 3): Paul Baran, “Some Theoretical Implications”: Monthly Review, Vol. 64, No. 3. July-August 2012. The July-August 2012 issue of Monthly Review1 centers around the publication of one of two missing chapters of Monopoly Capital: An Essay on the American Economic and Social Order2 by Paul Baran and Paul Sweezy. Anti-Imperialism.com earlier posted about this issue and the suggestion was made that individuals who are interested in the topic of class under imperialism should find a copy. Needless to say, it provides much valuable information in support of the argument that a large proportion or majority of the populations of countries such as the US fall on the net-exploiter side of the world-economy. Along with Zak Cope’s Divided World Divided Class, 3 this particular issue of Monthly Review has made 2012 a notable year for shedding additional light on these questions. The following review of “Some Theoretical Implications” will be the first of three on essays featured in the July-August issue Monthly Review. Part two will be on Samir Amin’s essay, “The Surplus in Monopoly Capital and the Imperialist Rent.” Part three will be on “The GDP Illusion: Valued Added versus Value Capture” by John Smith. At this point it might be suitable to point out that none of these essays contain a complete theory nor do any claim or aim to. Rather, each are devoted to particular, highly relevant aspects of the global economy and all are written from a perspective of critical opposition. While all are highly illustrative, it is up to the audience to induce reasonable, revolutionary practices or to continue such dialogue in positive ways and with a wider scope. “Some Theoretical Implications” was the title of one of the two chapters omitted from the final 1966 publication of Monopoly Capital: An Analysis of the American Economic and Social Order. 6 Though the book was a product of the joint work of Paul Baran and Paul Sweezy, this missing chapter mainly reflected the ideas of the former, who died before its publication. Rather than going into a full history of why the chapter did not make the final cut, this particular essay will deal strictly with the ideas it presented. 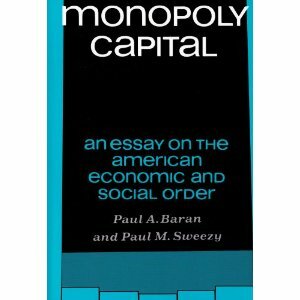 Baran’s missing chapter centers in part around the concept of “economic surplus.” Throughout their book, Baran and Sweezy set out to demonstrate the qualitative differences between ‘competitive capitalism’ as described by Karl Marx and ‘monopoly capitalism’ which had developed to full force by the 1960s. In many ways, this missing chapter and the corresponding notion of surplus formed the keystone of their argument regarding this difference. In a nutshell, insofar as a majority of Amerikan workers are ‘exploited,’ it is because they spend their wages on overpriced rents, superfluous consumer products, and other luxury items (and thus allowing this surplus included in their wages to be recaptured through realization), not because they are paid a wage that is less than the abstract value of labor. Moreover, this sort of ‘exploitation’ is an integral part of today’s world-economy and is a means by which capital is further concentrated in the monopolistic First World. Backing up a bit, the advent of monopoly capitalism corresponds with series of shifts in the manner in which the world-economy operates. Under monopoly capitalism, the sales effort becomes an increasingly integral part of the production process. Wants, often perfunctory, are more and more created via the sales effort rather than simply satisfied by the produced process, and the physical qualities of products are increasing adapted to this sales effort. 18 While the generation of surplus value or realization or profit under earlier competitive capitalism corresponded to the satisfaction of some human want, under monopoly capitalism “the satisfaction of wants tends to bear a diminishing relation to the requirements of human welfare” and “a large and growing share of total human efforts [becomes] directed towards waste and destruction.” 19 According to Baran, “as an important proportion of the total human effort is devoted to the production of goods the demand for which is artificially generated by profit-seeking corporations, the rationality and productivity of the effort itself can no longer be taken for granted.” 20 Under monopoly capitalism investment is increasingly geared not towards the development of productive forces but instead “towards advertising and the build up of trade-marks, towards construction of sumptuous palaces housing the executive offices of giant corporations, towards the development of marketing and production variety,” as well as “ever new factories producing the means of mass destruction.” 21 Monopoly capitalism is not just directly against the class interest the proletariat but gradually becomes a system increasingly at odds with the long-term interests of humanity in general- and the very conception of humanity set forth under capitalism, that of individual free agents. The irrationality of monopoly capitalism also corresponded with growth of “economic surplus” and its importance in the world-economy. As Baran stated, the “difference between what we call ‘economic surplus’ and aggregate surplus value is the result of the ascendancy of monopolistic enterprises and of the historical rise in the level of wages, leading to the incorporation in wages of a ‘surplus’ element.” 24 That is to say that surplus is larger than aggregate surplus value. Whereas surplus is the difference between the necessary cost of reproducing productive labor for a given period and the product which such labor produces in the same period, surplus value relates to the difference between the price of labor power and value captured through its application. During capitalism’s competitive phase (and in regards to the capitalist economies of many Third World countries), wages were paid at levels which maintained reproduction of labor and little else. In this case, the economic surplus of the social product was almost entirely captured by the ruling classes and could simply be treated as surplus value. Under monopoly capitalism, an increasing proportion of surplus find its way into the wages of core-zone workers, whose wages are at once far above a global comparison and artificially depressed through “profits by deduction” made by sales of consumer products and over-valued basic commodities. While Baran’s notion of surplus sheds light on its destructive misuse of under capitalism-imperialism, it also helps us conceptualize socialist and communist futures. The same productive technologies which have enabled monopoly capitalist to extend the social and temporal scope of its parasitism can also be used to liberate the masses of people. Rationally directed for the democratic, equitable allocation of use values, the productive forces generated under monopoly capitalism can be utilized for the collective betterment of humanity, freeing the proletariat from perpetual toil and allowing for a reasonable, sustainable, and notably better lifestyle for the 80% of humanity which currently finds itself on the brink of poverty. Furthermore, not every wage drawn from surplus need be abolished. Teachers and other school faculty, for example, are paid through surplus. Yet one could imagine the continuation or reintegration of educational institutions into post-revolutionary society even though almost no value is actually produced on a school campus. In many ways, socialism is the expansion, democratization and socialization of the allocation of surplus in a way that promotes the reproduction of a system based on equally and abundance. Thus, only parasitic economic activity which occurs at schools need be abolished. For example, financial aid counseling, negotiating contracts with vending machine operators, or those jobs related to the marketing of the school to potential students would all find no place in a socialist society. While mainstream Marxism since Marx (with some exceptions) has been unable to keep up with the development of capitalism through today, Baran’s missing chapter of Monopoly Capital offers those who understand the importance of the question of global class an interesting and rich analysis on which to build. Analyses like those presented by Baran not only illuminate new difficulties and old problems which revolutionaries will likely encounter, they help reveal what is at stake and what is to be gained through class struggle itself. The intellectual and activist community around Anti-Imperialism.com has long questioned the a priori belief held by the ‘left’ that Amerikan workers deserve more. We have been among the few that have declared that as part of the struggle against imperialism, a large portion if not majority of First World workers are functionally part of the forces of reaction rather than revolution, and that they operate as net-exploiters within the world-economy and not exploited producers of surplus value. “Some Theoretical Implications” add another bit of efficacy to this analysis. Baran’s notion of economic surplus provides an additional way of looking into these questions, illuminating not only the existence of a large propertyless First World petty-bourgeoisie class but also demonstrating more precisely its role within the world-economy. Though monopoly capitalism- imperialism- is increasingly decadent, parasitic, irrational, destructive, and illegitimate, these facts alone will not bring it to an end. Nor will awareness of these facts among academics provide immediate impetus for the creation of a new system. Instead, it is up to revolutionary parties, organizations, and movements, informed with the best understandings possible, to develop effective strategies which enable humanity to bridge past this wasteful and detrimental system and towards a new one based on the rational, sustainable, and equitable distribution of the world’s social product. 1Monthly Review. Vol. 64, No. 3. July-August 2012. 2Baran, Paul A. & Sweezy, Paul M. Monopoly Capital: An Essay on the American Economic and Social Order. Monthly Review Press. 1966. 3Cope, Zak. Divided World Divided Class: Global Political Economy and the Stratification of Labor Under Capitalism. Kersplebedeb. 2012. 4Bellamy Foster, John. “A Missing Chapter of Monopoly Capital.” Monthly Review. Vol. 64, No. 3. July-August 2012. p 20. 6Baran, Paul. “Some Theoretical Implications.” Monthly Review. Vol. 64, No. 3. July-August 2012. p 24-59. 12Cope, Zak. Divided World Divided Class: Global Political Economy and the Stratification of Labour Under Capitalism. 2012. Kersplebedeb. p.43. 14Wallerstein, Immanuel. World-Systems Analysis, An Introduction. Duke University Press. 2004.